When I first started this blog, I was really inspired and excited to share my thoughts and the things I experiment in the kitchen. This has later changed and it felt more like something I have to force myself into doing. But I realized that forcing myself into blogging would eventually make me hate the whole thing. I mean you don’t really force yourself into practicing one of your hobbies? It’s a hobby because it’s something you do for enjoyment, when you feel like it. Nonetheless, I felt I owe this blog a post expressing my gratitude before the start of the new year. That’s how I can best describe how I felt this year. And it has been rewarding in so many ways. I have thankfully grown to embrace uncertainty, to actually enjoy and appreciate it. I have learned that internal quarrels are inevitable, and the mere realization makes them much more tolerable. And over time, you begin to learn how to replace your irrational judgments about yourself and the world with rational ones. And that’s when you start cultivating inner peace. For me sunrise is very much connected with inner peace. This month, I have been blessed to watch the most entrancing sunrise I have ever seen in my entire life. Alive, is how I felt. Unfortunately, I haven’t been able to take photos but I will always have that image and moment cherished in my memory. I have to share a photo of the sunset though (excuse the low resolution) because the weather was perfect and the sunset was magical that day. Food is not just food. As food has profoundly helped me cultivate my sense of gratitude, I always try to look deeper for more things to be grateful for. and as I keep trying out new recipes, I keep learning that from the part of buying the ingredients to trying out the final product, there are so many things to be grateful for. So many things that made me believe the list is endless. Our senses… how often do we think “what a wonderful blessing it truly is to be able to see, smell and taste what I eat!”? How much thought do we give to those who have access to a very limited variety of food? How much thought do we give to those who cannot afford basic ingredients that are pantry staples for us? You see how food is not just food and yet one of God’s greatest blessings that not everyone is fortunate to have enough of. and so I believe bringing mindfulness into our relationship with food is important. Bringing mindfulness does not just stop at engaging our senses to have a pleasurable eating experience. We actually begin to realize what it is like to be present. We begin to give more value to what we have. and when we give more value to what we have, we help cultivate our sense of gratitude, empathy and compassion. What if we start looking at every aspect of our lives this way? Think how much our satisfaction and happiness levels would be altered! The child in me makes me happy. The child in me goes on Youtube and listens to old cartoon songs. In this messy world, the child in me does this now more than ever. When a song of a cartoon that I used to watch is on TV, I can’t help but turn the volume up and sing along. It brings inexplicable joy. Speaking of childhood, my dad bought two boxes of these Hello Panda biscuits! For some time I wondered why I still love these chocolate filled biscuits. That is because I stopped liking almost all of the processed sweets and candy bars that I used to eat. For me, most taste like sugar, and some just did not retain their original taste. But later I figured that in Hello Panda (although containing questionable ingredients), the sugar is not the first nor the second ingredient, so yay! I tried the yellow for the first time a few days ago. It is a little bit sweeter so long live the original! I haven’t posted something in months and that is partly because of my overly crowded mind, which made it hard to put thoughts together into words. Subsequently, I believed that there was no point in trying. When I decided to give myself the chance to write things down, I realized how immensely helpful writing could be. Post graduation blues or whatever that is called. After some time, I kept trying to put this feeling on hold by distracting myself as much as I could. I created a comfort zone that was so difficult to get out of. I have grown more reclusive.. getting in touch with my people has made me feel uneasy. I suppose I did not want to be confronted with questions. I have been struggling with contradicting thoughts, unstable emotions and unanswered questions. I have been berating myself for what I did and didn’t, should and shouldn’t. My feelings have been continuously juggling between happiness, sadness, utter joy, enthusiasm, guilt and frustration. In spite of that, my gratitude level (thankfully) has not gone low. I find happiness in the littlest of things and I am ever so content with what I have been given. We struggle to grow.. How often do we recall this fact when we go through something unpleasant? not so often I guess? I used to be a believer of positive thinking…. but that changed some time last year. I found it strange that coming across the term “positive thinking” has sometimes become irritating to me. One reason is because some people make it sound too easy to choose thoughts/feelings. I experienced (and still sometimes experience) periods of deep sadness and often, I let the feelings be there. I let those feelings be there and take their time because I know they are temporary.. I know that the light will return. then unwanted thoughts sink into your mind and consume you. I feel grateful everyday, yet I feel stuck. I feel content, yet I question my own existence. I am happy, yet feel sad. It is not about happiness though, because I have countless reasons to feel happy. Perhaps this is a phase that will pass I say. And although this is most likely true, recurrent feelings of sadness and frustration have proven to be far more dangerous than I thought they would be. Even if I am to get over with this phase, I know that my heart has been tainted, my judgment has been clouded and part of my soul has been ruined. For that, I couldn’t let it pass without purifying what’s been tainted and restoring what’s been ruined. Even when I seem to know what the problem is, even when the solution seems to be right in front of me, knowing is far different from embodying. And so I find myself rather stuck in limbo. When one is their own worst critic, the battle can become infuriating, and this is when you fear things getting out of control. When self-criticism reaches the point of questioning one’s own existence and worthiness, it is very much difficult not be hard on one’s self because you think you’re going backwards. You lift your heart up to God and you find comfort in reassuring yourself that time heals all..
And while maintaining balance is not easy and that light does not come with answers, this mere realization comforts you in one way and encourages you to continue your journey in another. We are told to believe that we can choose to feel or be a certain way, but why? Why suffer from forcing something into and out of our minds? Why not let things be? Why not accept the fact that we rise and fall? Because acceptance will eventually teach us to live with uncertainties, embrace our insecurities and value the struggle. Thankfully, I am blessed with two to help me along the way: Faith in God and my family. The greatest blessings of all, and for that I am sincerely grateful. I did not wholeheartedly believe that “Chocolate is THE Answer” until I realized that healthy chocolate treats almost always make it all better! “enjoy” and “a piece of chocolate” just don’t match. Only if a piece of dark chocolate was to refer to chocolate fudge like these cute babies! The honey jar is my favorite. Only because Winnie the Pooh reminds me of myself when he indulgently eats honey out of the jar.. except that I do that with chocolate! I mean.. what is enjoying chocolate really if you don’t have stains all over your face and/or clothes? well, not really but I guess it’s because of my siblings always mockingly pointing out that I must leave a trademark (AKA chocolate stains) when I make and eat chocolatey treats! Although I laughed every time, sometimes I get a little annoyed when I try to be careful yet still end up having chocolate stains all over my pajamas. What else is known to be perfect with chocolate…. Avocados! Ever since I tried Avocado brownies, I fell in love with the combination! 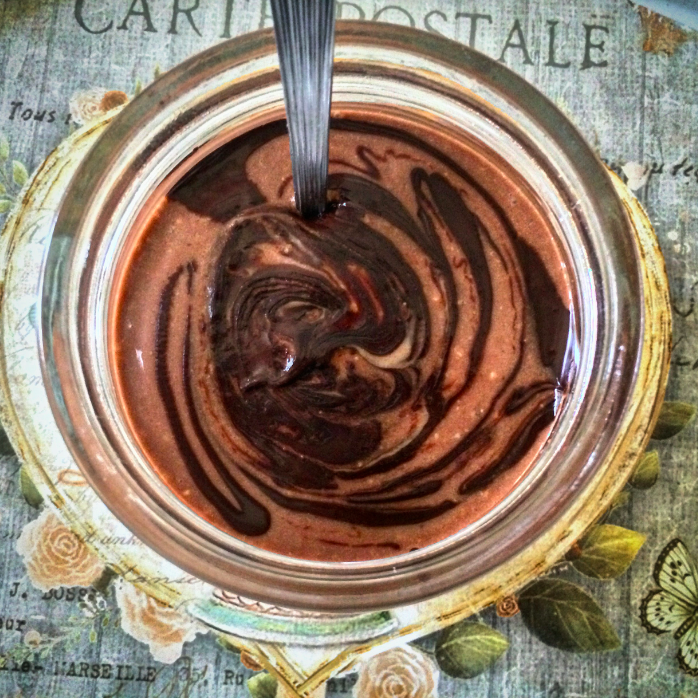 Then recently I decided to finally try Avocado Chocolate Mousse and Oh.My.Lord…!! it totally exceeded my expectations!! 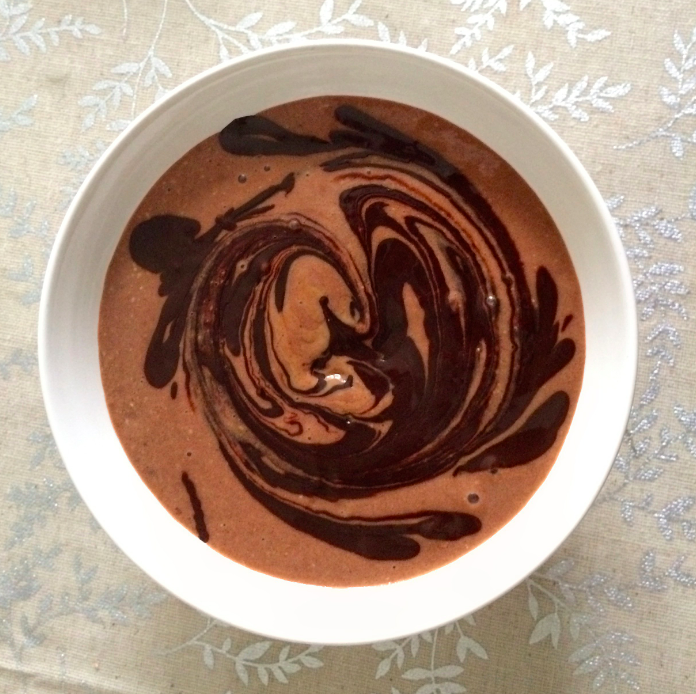 I mean, I still cannot get over how smooth, silky and super chocolatey this mousse is! I guess my chocolate craving has been just triggered so off to the kitchen! Getting to eat healthy is a blessings I am thankful for, everyday. I get excited about making, eating, seeing and talking about good food, and this feeling of excitement is something I truly cherish. It is something I cherish because for many people food is just food. For me it is not only a source of nourishment and happiness but also plays a great part in deepening my sense of gratitude. 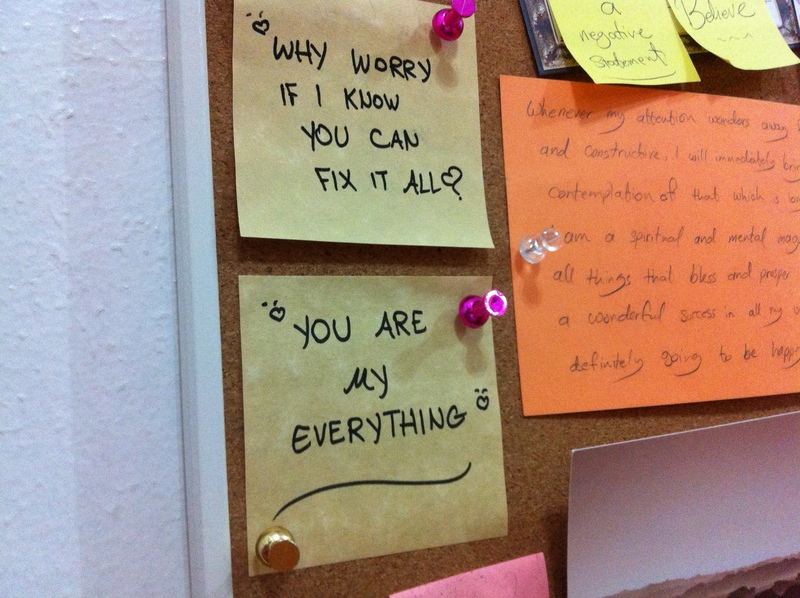 and what makes me grateful the most? Oh that’s simple….Chocolate!! Really, what’s better than starting your day with super chocolatey goodness? This double chocolate smoothie is an absolute favorite. I would totally have it everyday! Blend all ingredients until smooth. 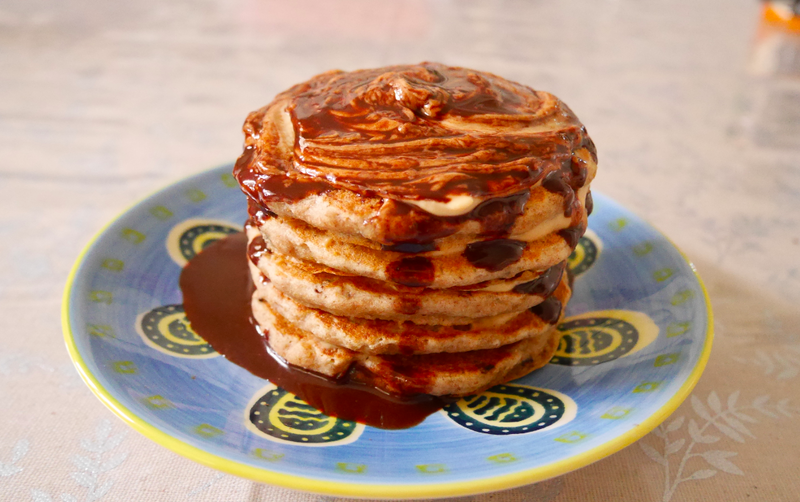 Top with almond butter and melted dark chocolate. Enjoy and remind yourself of how blessed you are before, while and after you eat! and I thought to myself, “I am not letting the first month of the new year pass without posting something”. I love to share but for a while, I felt so close to giving up because I haven’t been able to write, share and give. I haven’t been able to get myself together and although I have just come back from a trip, where I did something I truly love, I couldn’t reach that state of contentment I have reached before. I wasn’t sure if I should share this but I guess there’s nothing wrong with being transparent. Besides, one way or another, letting things out is perhaps helpful not only for me, but for those who feel the same way. They say “we teach people what we need the most”… I talk of happiness and contentment and deep inside, I feel like I am all over the place. It’s not that I am not happy because I am.. I am content with what I have been given. I am always grateful for all the blessings I have been given… sometimes I even wonder, what have I done to deserve so much? and that’s when it kills me…. Getting and not giving back.. Okay then.. it’s just as simple as that: Give back! but here’s the story of my life…. But wait… how can one achieve anything without a plan? “Alright.. so let’s start planning on a small scale and have a list of options”. “Oh, who’s this? fear? is it you? Oh please this is a not the time to visit”. and while I start rebuilding, it is not easy to stop being hard on myself..
Then it seems like the process is going to take forever… and that is when I feel so close to giving up. and while I seem to be letting my insecurities get the best of me, there is this one thing that I know will keep me going.. There is this thing that I know I will never let go of, and that is faith. This picture right here is one of my favorites.. Beside the fact that it reminds me of a happy day, when I look at it, I am always reminded of hope, patience, love and happiness. Am I losing patience you say? Celebrating my birthday was never “something” to me…sometimes it passes just like an ordinary day.. This year, I did not give it any thought because I started to have this belief that each day is to be celebrated and is to be grateful for. Only when I was reminded, I realized that my birthday was coming up soon. I love breakfast. It’s my favorite meal so this morning I thought: why not celebrate a little with a healthy and oh-my-this-is-super-awesome breakfast? 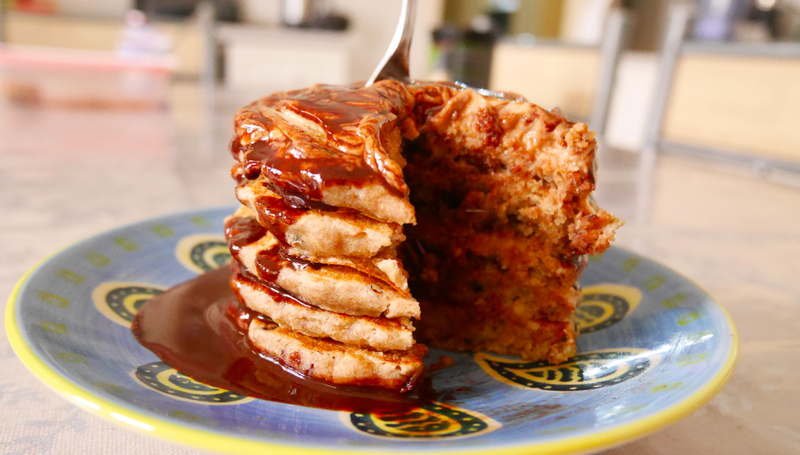 Spelt flour coffee-flavored pancakes with peanut butter frosting and homemade chocolate sauce using coconut oil sounded perfect! It was great.. but what was even greater is my best friend’s text, which made me feel all special! it wasn’t the special-me feeling but rather the special-to-be-blessed feeling. It was then that I thought: Why have I never given birthdays a different perspective? We should always show an attitude of perpetual gratitude but why not give the blessings that we are given more thought on our birthdays? A day to count blessings, which are in the end, countless. On this day, I would like to share my energy that is filled with love and happiness to my family, friends, readers and anyone who comes across this post. I was just about to publish this post when my eyes spotted this!!! Isn’t my sister the best person in this whole world or what?! 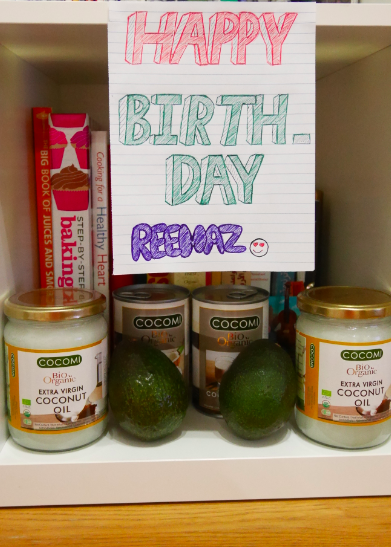 Coconut oil, coconut milk and AVOCADOS! My happiness is reaching infinity!! But that has changed long ago to brownies and fudgy-chocolatey treats. 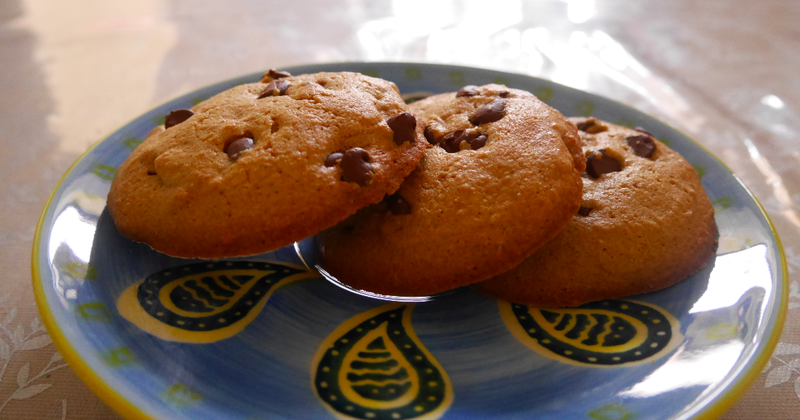 Yet still, cookies are among the best treats that one could have because well, they are…cookies! am I right or am I right? Don’t you see the sun shining? 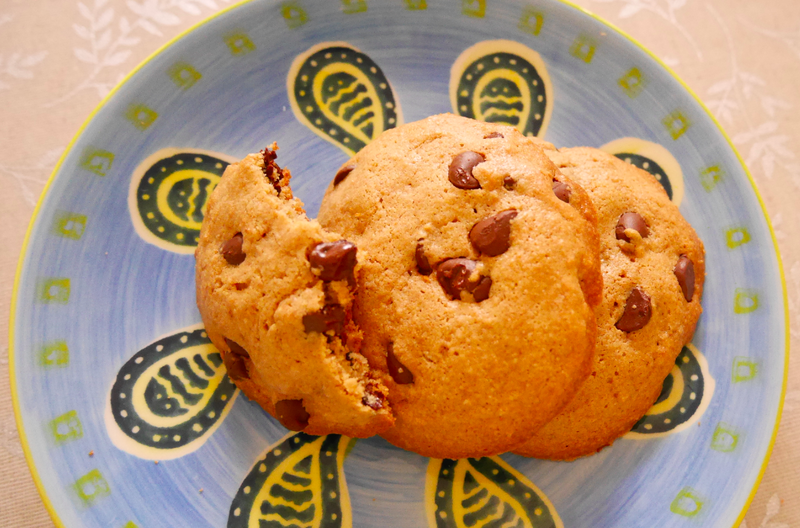 This means… Cookies for BREAKFAST! 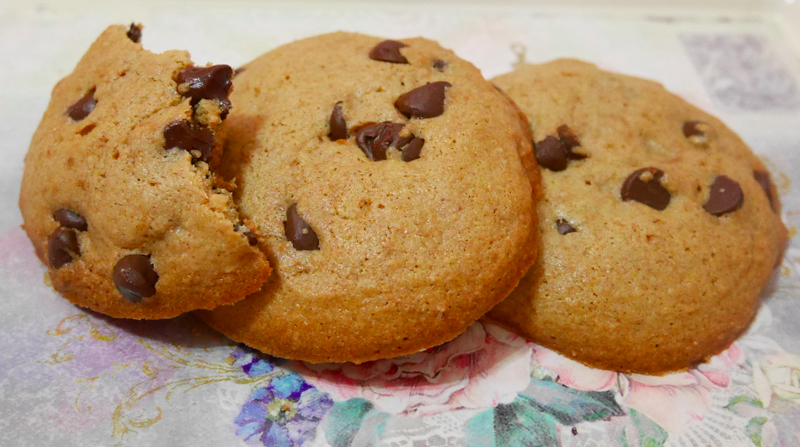 These Chocolate Chip Cookies are perfection.. their taste and texture are similar to that of the real buttery stuff, only they are better and not only because they are guilt-free! Perfect sweetness and sans butter…. Don’t you see how gorgeous these are? 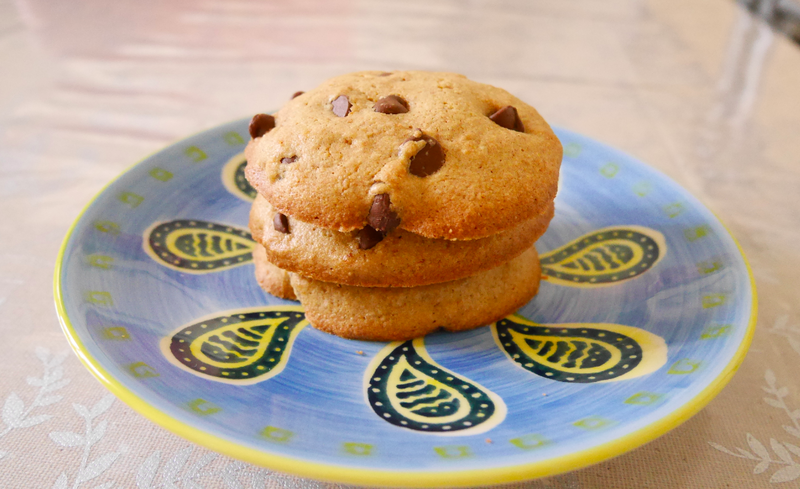 Original Recipe: One-Bowl Chocolate Chip Cookies for Two. In another bowl, mix coconut oil, sugar, egg and vanilla. Pour wet into dry and stir in chocolate chips. Use a cookie scoop or roll dough into balls and place on a lightly greased pan. (If not using a cookie scoop and the cookie dough does not seem easy to roll, refrigerate for 10 minutes).